How Much Does the 2019 Kia Optima Cost? How Many MPG Does the 2019 Kia Optima Get? What’s New for the 2019 Kia Optima? The 2019 KIA Optima was built with the finest standards of innovation and technology in mind. The exterior features stylish new options that will be sure to turn heads on your daily commute. Driver safety in the 2019 Kia Optima is a top priority as shown by the integration of Kia Drive Wise technologies. This technology can help alert drivers to the potential for accidents. Standard in all 2019 Kia Optima vehicles is the Forward Collision Avoidance Assistant system as well as the Lane Keeping Assist system. These features can help you drive in confidence and make the 2019 Kia Optima a top choice as a first vehicle option for teenager drivers that are still learning the ways of the road. When it comes to performance options, the 2019 Kia Optima offers impressive options at all trim package levels. The 2019 Kia Optima was crafted with fuel efficiency in mind. The vehicle was also engineered and crafted with safety in mind. Airbags can be found on all sides of the vehicle to keep you safe and secure in the event of an accident. Seating for children is also easy to install with the integration of the LATCH system. Carriage Kia of Woodstock is your home for the all new 2019 KIA Optima. Visit our dealership today to explore our wide selection of new and used vehicles. Our inventory of vehicles is constantly changing to show some of the finest innovations of vehicle technology the automotive market currently has to offer. 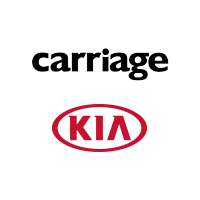 At Carriage Kia of Woodstock, we make the highest level of customer service and customer satisfaction our very top priority. Our skilled team of vehicle specialists and automotive experts are fully committed to helping customers discover the perfect vehicle for their needs. * Starting price is manufacturer’s suggested retail price (MSRP) for lowest model trim. See ‘Trims’ section for MSRP of model shown. MSRP excludes destination and handling charges, taxes, title, license, options and dealer charges. Actual prices set by dealer and may vary.